Fuji Xerox brings you a revolutionary colour wide format inkjet printer that delivers high productivity and outstanding image quality. 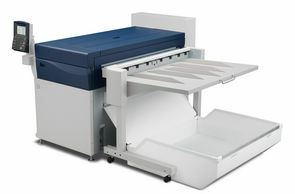 Fuji Xerox has applied this concept to the IJP2000 wide format printer. The IJP2000 is capable of producing an impressive colour output resolution of 1,600 x 1,600 dpi or equivalent at a print speed of 7 A0-size sheets per minute, 152.4 mm per second. The unprecedented productivity and image quality are realised by the adoption of the fixed line head system. The IJP2000's professional specifications offers a giant leap for businesses. High-speed output with 7 A0-size sheets / min., 152.4 mm /sec. It's capable of producing an impressive colour output resolution of 1,600 x 1,600 dpi or equivalent at a print speed of 7 A0-size sheets per minute, 152.4 mm per second. Various types of data can be printed continuously, thereby making a huge contribution to the reduction of working hours and the enhancement of productivity. Furthermore, the print speed is consistent even when printing on different paper types. A1 Landscape: 12 sheets/min., Portrait: 9 sheets/min. The Xerox enables long-paper printing of up to 5,000 mm* with all available paper types such as plain papers, matte coated papers, tracing papers, and films. It supports various applications such as producing exhibition banner or labarum and in-store large- size display. * 2,000 mm when using manual feed. To find out more information on this device please contact us and we will be happy to discuss it further.